When your home is organized, you make the most of every room. If your closet is organized, you won’t feel stressed trying to find an article of clothing during the morning rush. 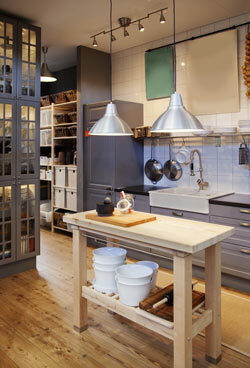 If your kitchen is orderly, you'll easily find any utensil, pot or spice; making meal preparation that much easier. If your living room is clutter free, you can unwind after a long day. 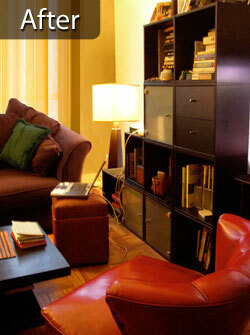 A clients' studio living room before and after a home reorganization by Chaos Commandos. Mouseover to see Before. If your computer room is organized, you will find that helping your children with homework is easier than ever. Having a home that is organized helps your family run smoother and stress-free. If an unexpected guest drops by, you won’t be embarrassed by your cluttered home. Being organized allows you to enjoy other things in your life, rather than be distracted by the disorder that clutter brings. Our home organizing service can work with your goals, and can help you create a system that works for you and your family. Toys? Electronics? Sports Equipment? Craft supplies? We can help you organize all of these things, making them quick and easy to access while keeping your home clutter-free. An organized home also improves everyone’s mood, and encourages respect for everyone's belongings and personal space. 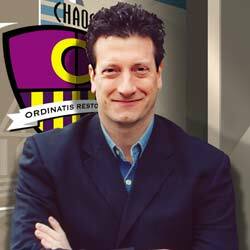 We have more than 12 years of experience as NYC Home Organizers. We’ve organized kids’ rooms while still keeping them playful and creative, created organized but soothing retreats for book lovers, found efficient office spaces within the smallest of kitchens and designed functional workspaces for those who work from home. With our training and vision, our home organizing service can help you create the home you desire. A home that works for you and your lifestyle. We can create a child’s room that everyone will love. It’s no big secret that a child’s room is often one of the most unorganized rooms in the home, no matter what age they are. Children like to surround themselves with toys and mementos they love, which to a parent can look like a chaotic mess. Yet to the child, looks wonderful. We'll help find the common ground to satisfy both kids and parents alike. We can build storage solutions that not only allow toys and other items to have their own place, but be functional and easy for kids to use. Cleaning up their room will be easier, giving mom a much needed break. A home organizer will work with the child to find out what colors and themes they like. We guarantee your child will love the new look of their organized room. Closets can quickly become cluttered, making it hard to find what you need. Clothes that are packed tightly into closets age faster, and require cleaning more often. Bugs, such as moths also love cramped, dark spaces! Utilizing our unique closet organizing service, we can show you how we can make your closet feel so much larger and spacious. Our professional home organizers will sit down with you and walk through your wardrobe, understanding what you wear and when you wear it. We can organize shoes, belts, ties, jewelry and scarves, while making the most out of your space. We can build shelves to safely store your sweaters and fine clothing, allowing them to last for years to come, and design a closet hanging system that works for you and your specific wardrobe. Don’t let your collections and memorabilia overwhelm your home or sit in a box collecting dust. We know you’ve worked hard on your collection so that it’s a reflection of you. We can help organize your collections and display them properly, so you’ll be able to proudly show off an organized collection, rather than something that's scattered throughout the house. Whether for insurance purposes, or simply to keep track of the value of what you own, we can archive your collection digitally for inventory management purposes. Large, complex or technical collections are our specialty. 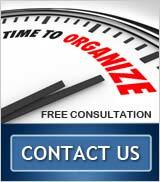 Let our our professional home organizers help you. 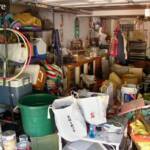 The garage is often the hidden space in our home. It’s where we pile up our possessions when we have no other place to put them, giving up valuable space. 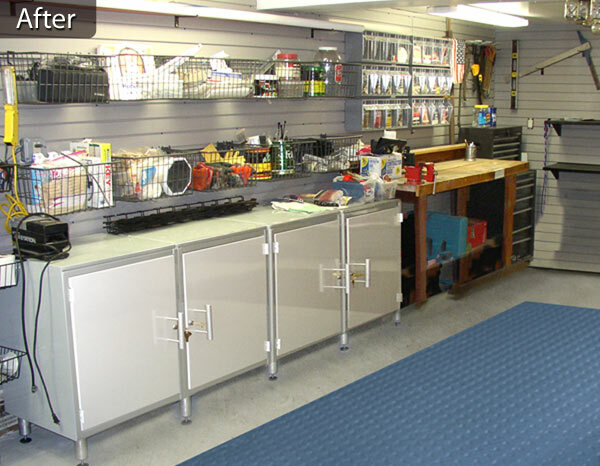 It's no wonder that our garage organizing service has become one of our most popular requests. 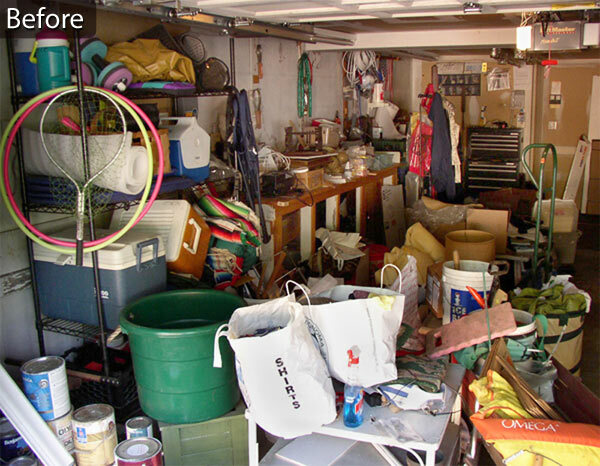 Cluttered Garage Before and After. Click to enlarge. Our home organizer can show you how to maximize your garage space. Want to park your car in it again? Need space to work on hobbies? 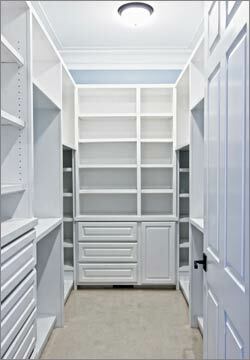 Crave the storage space for pantry and bulk items? We can help you with all of these. We can set up wall units to store supplies and holiday decorations, allowing easy access for when you need them. We can create an oasis for you to work with tools or create art. We can even show you how you can makeover your drab garage into an inviting home gym. Kitchens are the heart of the home. It is here where family meals are made, homework is done and conversations over snacks are held. It makes sense that you want this room to not only be organized but feel soothing as well. We can create drawers that organize utensils, holds pots and pans and even keep your Tupperware organized. Have a lot of spices? With our kitchen organizing service, we can create an organizational system that allows you to easily see and access everything your kitchen needs. Is your pantry overwhelming you? 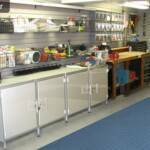 We can create additional shelving to help you store all your bulk needs. We can also create a workstation in your kitchen, perfect for when you need to quickly check your email or for children to finish their homework while you cook. All this will create an environment where cooking is stress-free and everyone feels welcomed to linger in your clutter-free kitchen. Our bathroom organizing service has no limits. We can create sleek storage solutions for everything from make-up to medications, saving valuable counter and cabinet space. 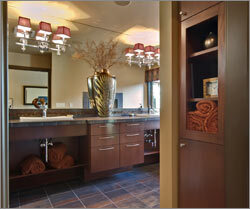 Mirrors can be transformed into mirrored cabinets, providing even more storage space. We can renovate your current bathtub or shower as well, allowing for even more storage and convenience.